I’ve also been really impressed by « Sword of Sodan ». The size of the characters and the audio were unbelievable for that time. The stage in the cemetery is my favorite (5’00 on the video). And here are my first Amiga demos. These are precomputed demos but already impressive. The Juggler demo is an animation, contain on one full disk. The animation have been rendered using a raytracing software. 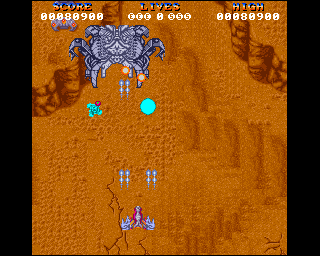 The images are displayed using the « HAM » special mode (« Hold and Modify » each pixel color is relative to the previous one, that allow to display up to 4096 colors). The other category of demos are the crack intros. At that time demos were quite small and often used to sign the crack of a game. I think this is the point in history were the intros became so nice that people wanted to see full demos without any associated games.